Placing a tax or fee on carbon (based on the usage of fossil fuels), together with returning the yielded revenue to the public in one form or another, can be an efficient approach in controlling emissions of greenhouse gases. That’s one of the findings of a broad analysis of a number of versions of such proposals, executed by researchers at MIT and the National Renewable Energy Laboratory (NREL). Furthermore, based on the precise mechanism selected, such a tax can also be fair and not impair low-income households, the researchers report. The analysis was part of a multi-collaborative effort to apply advanced modeling tools to evaluate the impacts of different proposed carbon-pricing schemes. Eleven research teams at different institutions conducted the research using a universal set of starting assumptions and policies. While major details differed, all the studies concluded that carbon taxes can be effective and, if correctly planned, need not be regressive. An overview report on the 11 studies appears in the April 6, 2018 issue of the journal Climate Change Economics, together with reports on the individual team results. The MIT and NREL team included former MIT postdoc Justin Caron, MIT Joint Program on the Science and Policy of Global Change Co-Director John Reilly, and Stuart Cohen and Maxwell Brown of NREL. Reilly, who is a senior lecturer at MIT’s Sloan School of Management, says the teams explored several options for a carbon tax and use of the resulting revenue. They examined two different starting values ($25 and $50 per ton of carbon emissions generated), and two different rates of increase (1% or 5% annually), as well as three different methods to return the revenue: an equal rebate to every household, a tax cut for individuals, or a corporate tax cut. Of the varying levels of fees, the team found, not unexpectedly, that the highest starting value and the maximum rate of increase produced the maximum emissions reductions. But the study revealed that even the lowest taxation rates could in themselves result in reductions adequate to meet the U.S. near-term commitment under the 2015 Paris Agreement on climate change, Reilly says. However, the most efficient method of accomplishing those reductions, with regards to overall impact on the economy, is to use the revenue to lower taxes on capital —investment income, or corporate profits. Given the comparatively high capital taxes in the U.S. (at the time this study was concluded) such cuts encourage economic growth more than breaks in other taxes or direct rebates to households. However, that alternative is also the most regressive, with its impact disproportionally landing on lower-income households. At the other extreme, the alternative of sending equal payments to everybody was found to be the least efficient for the economy on the whole, but also the least regressive. Personal tax cuts came in someplace in between on both criteria. But the researchers say another set-up, integrating the fundamental strategy of providing tax cuts to corporations but incorporating a rebate to the low-income families most impacted by the tax, could practically eliminate the regressive aspects of the tax at minimal cost in overall efficiency, and therefore might be the most attractive option. It could interest both for conservatives anxious about the costs of such a program, and for liberals apprehensive about its probable impacts on those at the lower end of the economic spectrum. It’s sort of an obvious solution to take some chunk of the money and use it to focus on the poorest households, and use the rest to cut taxes. It doesn’t seem like a hard thing. It is important to realize that this study was completed before the tax reform that took effect in January that slashed corporate income tax rates. Given that these tax rates have now been cut, and that those cuts will contribute to a growing deficit, we might better consider the revenue as a contribution to closing the deficit. Reilly’s team used an economic model created at MIT to evaluate the influence of different policies on the world’s probable climate trajectory and integrated that with a model of the country’s electrical system, built at NREL. This combination permitted the team to do a lot more comprehensive assessment of the way different policies would impact decisions by the power producers and distributors - the main point, since the electricity sector has the most direct potential for changes that could lower emissions and is the largest contributor to emissions generally. 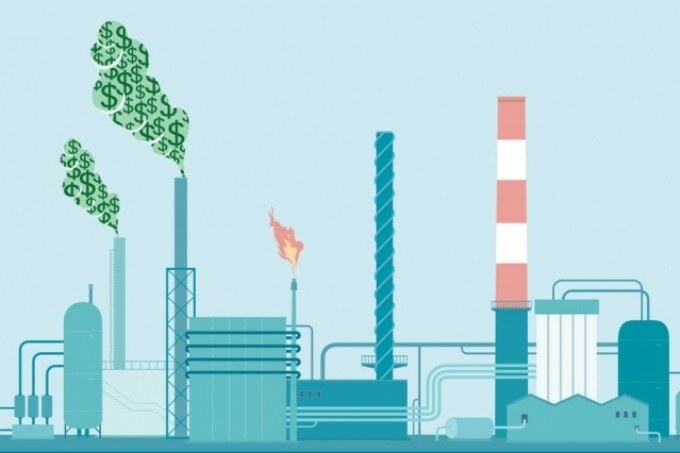 While certain versions of the carbon-pricing plan were assessed to be more efficient overall with regards to their impact on the economy, the study discovered that those impacts are in fact quite modest — even without taking into consideration potential benefits such as better health because of lowered pollution levels. The least-efficient policies still realized considerable emissions reductions, with a total impact of just four-tenths of a percent on economic growth. For the more efficient options, the same reductions could be realized at zero cost, or even a net gain to the economy, the researchers discovered. Caron, the paper’s lead author, who was an MIT postdoc during a majority of this research but is currently a professor at HEC business school in Montreal, says that all of the different research teams mostly found similar results, though there were disparities in the details. “Qualitatively, we all agree on many of the main conclusions.” That includes the fact that carbon taxes can certainly be an effective approach to curbing emissions. Reilly says “all these tax scenarios at worst meet U.S. commitments for 2030, and the $50 tax is well exceeding it.” A number of experts say the Paris Agreement alone will not be enough to control the disastrous consequences of global climate change, but this single measure would go a long way toward lowering that impact, Reilly says.